Description: This species is inconspicuous from a distance, but brightly-coloured on close examination. The body is transparent and colourless, with yellow tips to the oral tentacles and rhinophores. 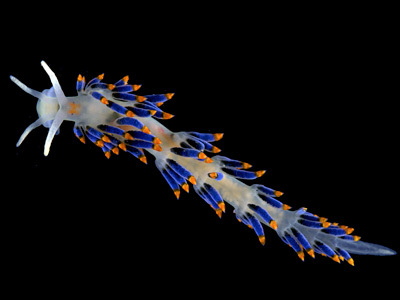 The cerata have a core of dark-green digestive gland, with bright blue pigment masking the central region of the gland and orange surface pigment over the outer third. A thin ring of orange is sometimes also present below the blue region. Typically about 10mm in length. 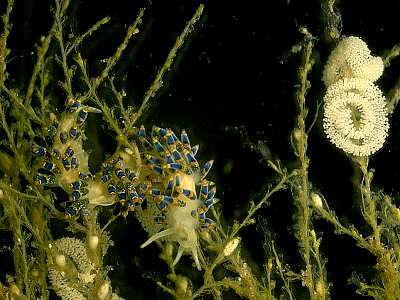 Habitat: Feeds on hydroids of the genus Sertularella, especially Sertularella polyzonias. The spawn is a thin, white, scalloped ribbon wound amongst the food. Distribution: Found all round the British Isles, and from Scandinavia to the Mediterranean Sea. Similar colouring in closely related species such as T. ornata from Japan and Hong Kong suggest that there are several similar species on a worldwide scale, and records of this species from Brazil and Florida should probably be referred to a separate species. Cerata with bright blue pigment in mid region, and an orange or red band above. Yellow rhinophores and oral tentacles. Picton, B.E. & Morrow, C.C. (2016). Trinchesia caerulea (Montagu, 1804). [In] Encyclopedia of Marine Life of Britain and Ireland.